For years Rob has enjoyed the craftsmanship and quality of Silver Brush so was thrilled when Dee Silver asked if she could tailor two lines of brushes to his needs. 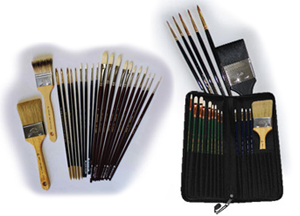 For more information on both the figure painting set and the portrait painting set go to the Silver Brush website. black, sanguine and white, kneaded erasers, chamois cloth. Paint colors (oils): burnt umber, burnt sienna, cadmium yellow light, cadmium orange, cadmium red light, permanent rose, alizarin crimson, manganese violet, diozixine violet (also called Windsor violet), ultra marine blue, cerulean blue, phthalocyanine blue, viridian, phthalocyanine green (Winsor & Newton calls their’s Winsor blue -It comes in two shades, red and green. Either if fine but if you are newly purchasing it, get the green), winsor green, titanium white, lead white or lead white replacement (flake white). Rob likes Winsor & Newton oils, but any brand above student grade is fine. Easel if you have one since the sponsor may not have enough for every student. PAINTS: The modern colors are available in most art stores and they are reasonably priced. The authentic colors can be found at online sellers such as http://www.naturalpigments.com/, but they can be quite expensive. Rob will have a selection of historic pigments and mediums to sample in class. IT IS NOT NECESSARY TO PURCHASE BOTH. The modern colors will allow you to achieve similar results. EARTH COLORS: Burnt Umber, Burnt Sienna, and any of the following: Transp. Red Iron Oxide, Ercolano red (Natural Pigments) or Indian/Venetian Red. Paint colors for grisaille workshops (oils): burnt umber, burnt sienna, cadmium orange, titanium white, lead white or lead white replacement (flake white). 2 sheets Strathmore Charcoal or Canson Mi-Tientes paper neutral or buff colored. Canvas: need two or three 11″x14″ or 16″x20″ or toned mid-gray with acrylic paint. You can tone them with white plus a little ivory black and a hint of burnt umber or use “Golden Heavy Bodied Neutral Gray N6” premixed acrylic. Canvas color should look similar in color to the gray box above (shown under “Painting Workshops”). Photo by Reece Pierce from one of our Ireland workshops. Paint colors (oils): burnt umber, burnt sienna, cadmium yellow light, cadmium orange, cadmium red light, permanent rose, alizarin crimson,manganese violet, diozixine violet (also called Windsor violet), ultramarine blue, cerulean blue, phthalocyanine blue, viridian, phthalocyaninegreen (Winsor & Newton calls their’s Winsor blue -It comes in two shades,red and green. Either if fine but if you are newly purchasing it, get thegreen), winsor green, titanium white, lead white or lead white replacement(flake white). Rob likes Winsor & Newton oils, but any brand above student grade is fine. Plastic garbage bags to store wet canvases or whatever else. Useful for keeping things dry if it rains. Small drawing board about 16×20. Either a piece of wood or one with clips. Easel French wooden easels are recommended for plein air painting since are nice and sturdy and have a little box that holds the paints, etc. for working outdoors. Clips and tape to hold canvases on to your easel. Folding stool Many people find these useful. Windbreaker or jacket, brimmed hat, sunglasses, bag to carry supplies, sturdy shoes or light hiking boots and anything you might need to be out in the weather. Canvas: bring a roll of canvas or panels. Rob says it is not necessary to prime the canvases that you plan to use for landscape painting. Approximately 8×10 or 9×12. Bring enough for one to two paintings each day you plan to paint. If you would like to, you can tone canvases ahead of time (mid-gray) with acrylic paint. You can tone them with white plus a little ivory black and a hint of burnt umber or use “Golden Heavy Bodied Neutral Gray N6” premixed acrylic. Canvas color should look similar in color to the gray box above (shown under “Painting Workshops”). Optional: Watercolors and ink and related materials (brushes, paper) if you would like to work in various mediums and pencils or charcoal, erasers and related materials for those who would like to draw. Though oil paints and some artist’s mediums are not flammable, airport security guards will confiscate them if you try to take them as carry-on.They must be checked with your luggage. Make sure to pack them well and double bag them in plastic bags or containers so they don’t soil your other belongings if they are punctured. There is also a possibility of bursting since they will not be in the pressurized part of the plane. PLEASE CHECK WITH YOUR AIRLINE FOR THEIR SPECIFIC RULES AND REGULATIONS REGARDING ARTIST’S MATERIALS. Solvents CANNOT be taken on the plane in any instance. Rob will have extra solvent on hand, so please bring an empty lidded jar. Another option is to ship oil paints and other non-flammables to the workshop destination ahead of time. Be sure to ask the workshop host if this is an option. If all else fails, contact Rob and he may be able to supply oil paints for you in some situations. Here are more travel tips for traveling with oil. Don’t forget your sketchbook on trips! I make my own with twinrocker paper. No need to go larger than 11″x14″. French (wooden) easels are ideal for travel since they are nice and sturdy and have a little box that holds the paints, etc. for working outdoors.